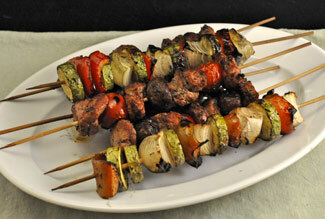 Grilled Tuna, Lamb Kebabs, are some of the main courses this week. To cook: Place on barbecue and spoon any remaining sauce on top. Cook, with the cover partially or fully closed, without turning, for 8 - 15 minutes, depending on how you want it done. Could also be roasted, 400F (200C) for about the same amount of time. 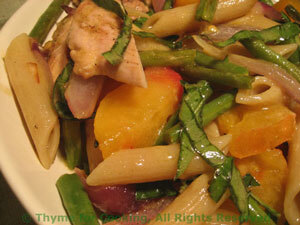 Grilled chicken and grilled or sautéed vegetables put a new twist on the old 'macaroni' or pasta salads of my childhood. 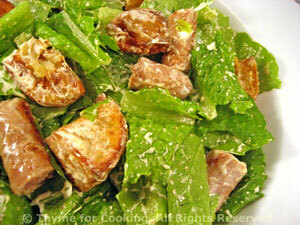 Serve the chicken cut in chunks, mixed with the salad (my choice) or sliced and served on top (mon mari's choice). Cook pasta according to package directions. When done, drain, rinse in cold water, drain well and put into large pasta bowl. In small bowl whisk together Worcestershire, vinegar and oil. 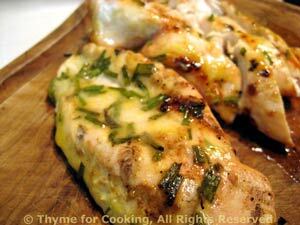 Put chicken breasts in glass baking dish and pour marinade over. Let marinate for 10 minutes. Cook on barbecue grill for 8 - 12 minutes per side or until done (test - take a peak), basting when you turn them with any leftover marinade. 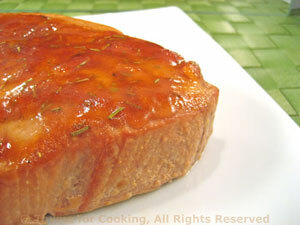 OR sauté in nonstick skillet for 8 - 10 minutes per side until nicely browned and done, basting with marinade. Slice peppers into long strips, then cut strips in half. Toss onion and pepper with oil and cook in grill pan on barbecue for 10 minutes, until crisp tender. Or sauté briefly over high heat until starting to brown but still crisp. Remove from heat and put into pasta bowl. Slice the carrot into paper thin strips using the vegetable peeler (hold onto to carrot and slice one half down to a thin stick. Holding on to the 'stick' slice the other half. Eat the stick). Slice celery thinly, at an angle to get pretty slices. 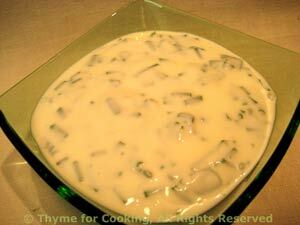 Put yogurt, mustard, lemon and mayo into a bowl and whisk together. Add the olive oil, 1 tbs at a time, and whisk. 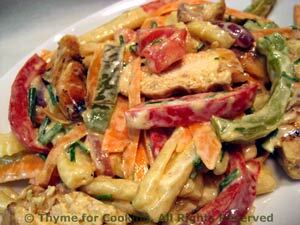 Put vegetables and herbs into bowl with pasta. Add dressing and mix well. Add chicken slices and toss gently to combine.... Or not. Serve.